School life has never been so splendid. Jolly hockey sticks! A collection of classic children’s stories from the world’s best-loved children’s author, Enid Blyton. School life has never been so splendid. Jolly hockey sticks! 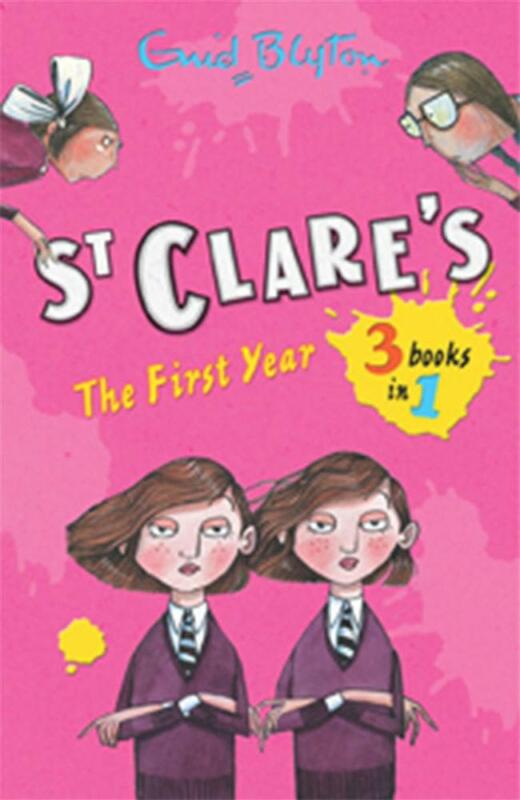 It’s the twins’ first year at St Clare’s – that means three terms of adventures in the same volume for the first time! Summer Term at St Clare’s. New girl Carlotta has a secret past! What will happen when sneaky Prudence tells the rest of the class? Watch out! There’s trouble at St Clare’s! Enid Blyton is arguably the most famous children’s author of all time, thanks to series such as The Wishing-Chair, The Faraway Tree-, The Mysteries, The Famous Five and The Secret Seven. Her school stories – including the St Clare’s and Malory Towers series are the perfect books for girls who are experiencing their own adventure at school. Enid Mary Blyton (11 August 1897 – 28 November 1968) was an English children's writer whose books have been among the world's bestsellers since the 1930s, selling more than 600 million copies. Blyton's books are still enormously popular, and have been translated into almost 90 languages; her first book, Child Whispers, a 24-page collection of poems, was published in 1922. She wrote on a wide range of topics including education, natural history, fantasy, mystery stories and biblical narratives, but is best remembered today for her Noddy, Famous Five, and Secret Seven series. Following the commercial success of her early novels such as Adventures of the Wishing Chair (1937), The Enchanted Wood (1939) and The Magic Faraway Tree (1943), Blyton went on to build a literary empire, sometimes producing fifty books a year in addition to her prolific magazine and newspaper contributions. Her writing was unplanned and sprang largely from her unconscious mind; she typed her stories as events unfolded before her. The sheer volume of her work and the speed with which it was produced led to rumours that Blyton employed an army of ghost writers, a charge she vigorously denied. Blyton's work became increasingly controversial among literary critics, teachers and parents from the 1950s onwards, because of the alleged unchallenging nature of her writing and the themes of her books, particularly the Noddy series. Some libraries and schools banned her works, which the BBC had refused to broadcast from the 1930s until the 1950s because they were perceived to lack literary merit. Her books have been criticised as being elitist, sexist, racist and xenophobic and at odds with the more liberal environment emerging in post-war Britain, but they have continued to be bestsellers since her death in 1968. The story of Blyton's life was dramatised in a BBC film entitled Enid, featuring Helena Bonham Carter in the title role and first broadcast in the United Kingdom in 2009. There have also been several adaptations of her books for stage, screen and television.